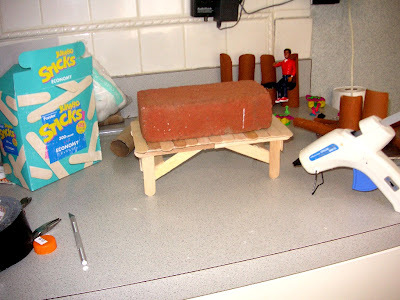 Here's how we made dining room furniture for the girls' dollhouse this morning. 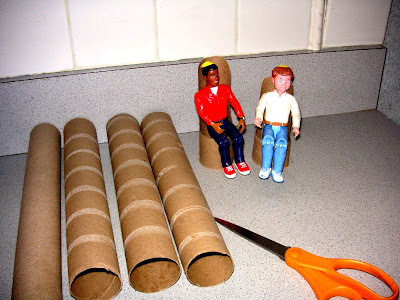 Start with an empty paper towel tube. 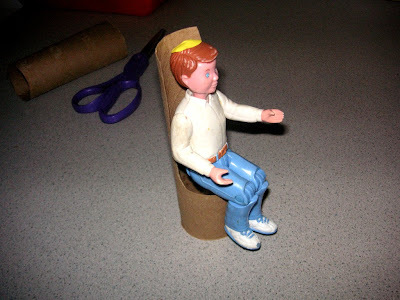 Take the largest doll (usually the "father" doll) and put him in a seated position. 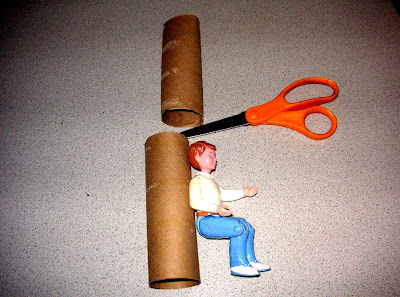 Cut the paper towel tube to the desired height of the chair. 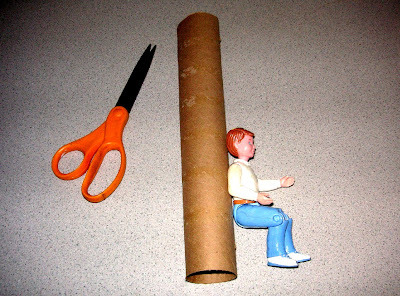 Using the doll's height as a guide, cut out a seat. 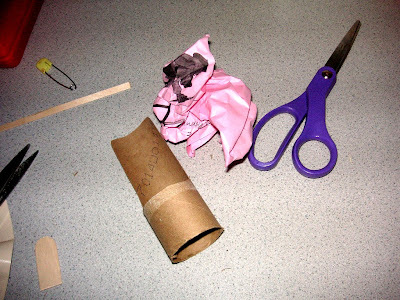 Save the piece of cardboard that was cut away from the tube. We'll be using it later. Repeat until enough chairs are made. 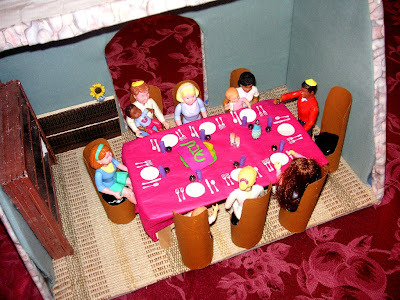 Test the chairs with different sized dolls. A half-gallon container makes a great template for a dining room table. Rinse the container, so it is clean of any food residue. 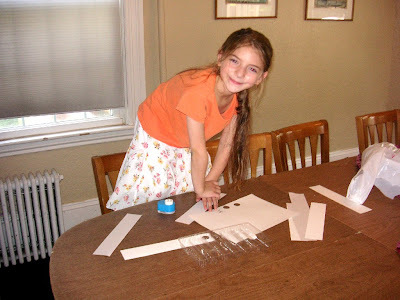 Here is Emily, sorting the "silverware" and "plates". We used the plastic tray from a manicotti box to keep them separate. 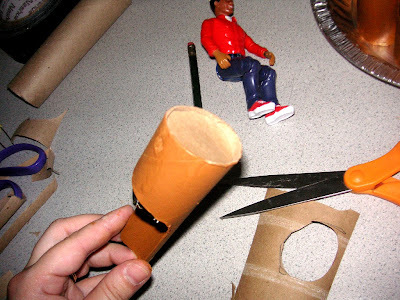 Stuff the paper into the seat of the cardboard tube. This will make the chair much more sturdy. 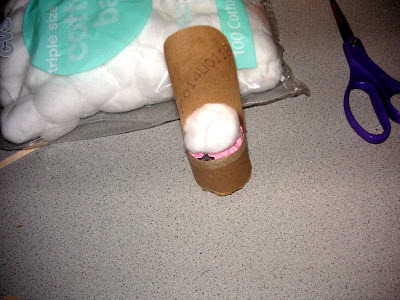 Place a cotton ball on top of the crumpled paper. The cotton ball should be just above the height of the seat. 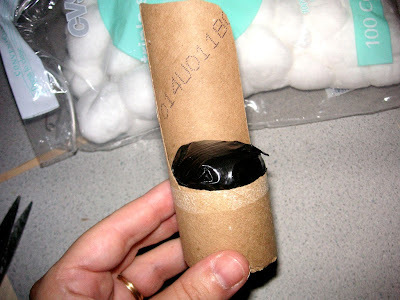 Remove the crumpled paper and cotton from the tube. 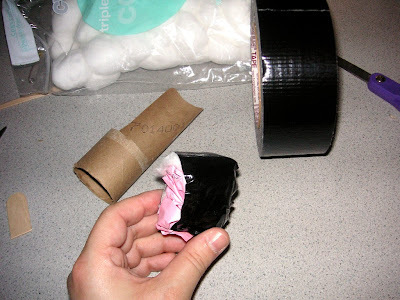 Place a piece of duct tape over them, centering it on the cotton ball. 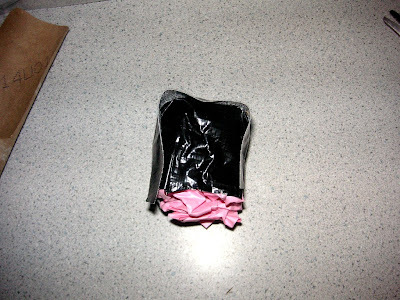 Place a second piece of duct tape, oriented 90 degrees away from the first, also centered on the cotton ball. Your seat is now upholstered in duct tape. Paint the empty tube-seats. Let them dry. Reinsert the duct-tape-upholstered seats in the dried, painted cardboard tubes. 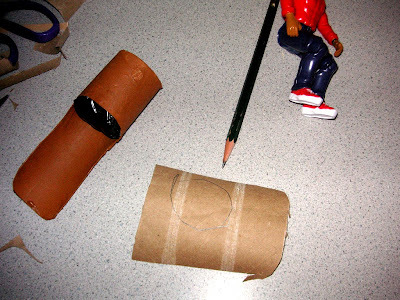 From the cut-away piece of cardboard (that I mentioned earlier), trace the shape of the tube's circular opening. Cut this circle out. 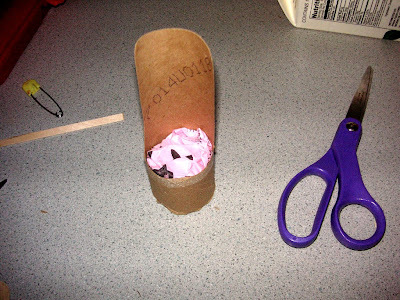 Glue the cardboard circle to the bottom of the chair, Push tightly to secure. 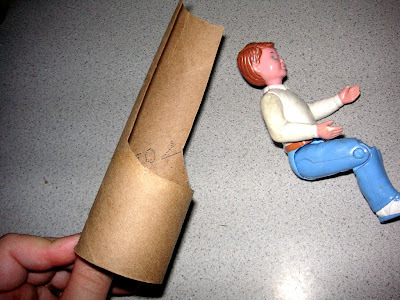 Test it with the doll to make sure it is solid and sturdy. The girls enjoyed making food from clay. Those yellow braids in the lower right hand corner are the challot Emily made. Gretta is making 'many many many cakes'. 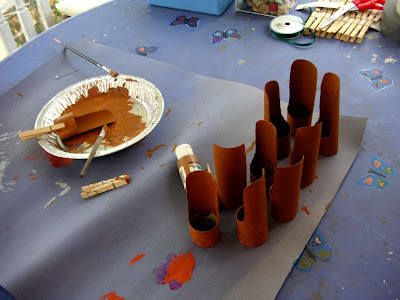 Cover the half gallon container frame with Popsicle/craft sticks. 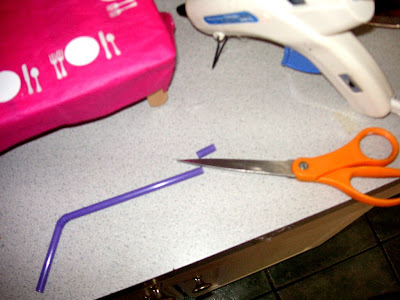 Snip sections of a drinking straw to make doll-sized drinking glasses. Single pony beads make great cups, too. bead makes a great kiddush cup. 28 comments, so far. Add yours now! This is all so brilliant! Great ideas. Thanks, Batya! I'm glad you're home, safe and sound - and back on the computer! Shavua tov. 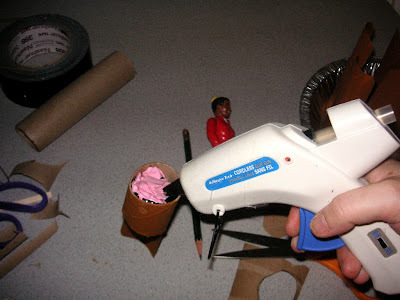 There is a book I saw about making minatures through the American Girl Doll Company. You should really consider publishing a Jewish version with some of these fantastic projects. They would make fantastic gifts. Thank you! I wonder if there would be a market for such a thing? 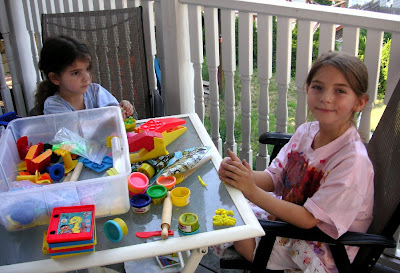 I know the girls and their friends enjoy making the projects and playing with the results. I'm going to have to look for the American Doll miniatures book - it sounds like a lot of fun! Great stuff. How about a Jewish mag like "Family Fun" which would include ideas for Chagim and Shabbat, general crafts, recipes, games, family vacation tips for Orthodox families... I can see it now. If you do it, please let me do the vacation stuff. I love that. Wow that's really cool. I might have to try that with my daughter. I'm so glad it was helpful but WAIT!! 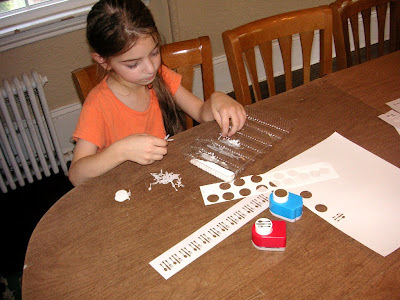 If you are making a theater, try this technique using egg cartons - stabilized with paint stirrers or cheap rulers - instead. It will save you LOTS of time! Best of luck! I'd love to see photos of your miniature theatre when you're done. Pretty cute dining room furniture set. I think I'll try that with my daughter. The images make great instructions we can follow. Thank you for sharing. 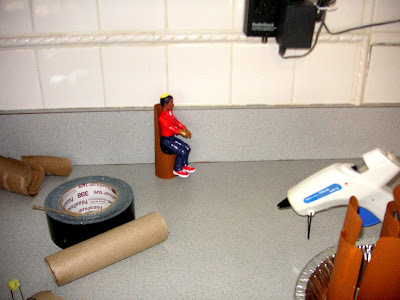 Can I alter the size of the chairs for a Barbie Doll or is it not strong enough? I haven't tried it with 11" dolls yet. It might need something heavier for ballast in the bottom of the tube, or some widening of the base. If you try it, please let us know if it works! Good luck! That looks great! I love your ideas. It will be so good for my 2 daughters at home. 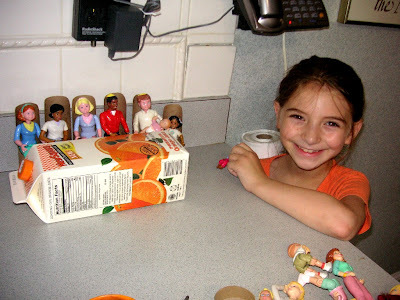 I also shop for dollhouse and miniatures at a website http://www.bostonminiatures.com They have a lot of good stuff for my collection and my daughters' dollhouses. Love the new chairs! !your so talented!looks great...hugs!! So cute ... I want one! Just brilliant...I think in market these things are rarely sold, but the projects like you have mentioned is really a very good stuff to buy..looks really useful as well.. 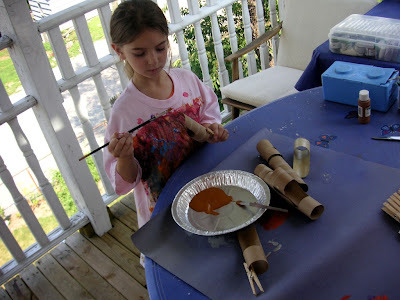 This is fantastic, i am so impressed!I love how creative you have been but mostly love the use of recycled materials and the fact that you're daughter could be involved in the creating process. Our 4 year old daughter has a wooden dolls house with some basic wooden furniture and dolls. She just loves doing 'crafty stuff' with me and so a few weeks ago we made a trampoline and slide to add some extra play to the dolls house. The trampoline was just old material stretched over a recycled food container and held on with a rubber band, and slide just cardboard and paddle pop sticks as struts. 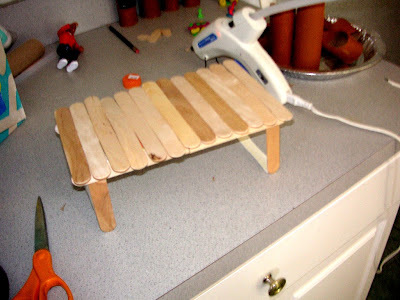 I am going to make the table and low backed version of your chairs as an outdoor setting this week, thanks! I like your informative blog. This is a great project. Very well written with great pictures! Thanks for the ideas! Hello this topic is very interesting. Keep it going man !